Summary: Morris, the littlest mole in his family, is different than the others. Instead of wearing the standard-issue mole work boots and hard hat, Morris prefers a dapper suit and bowler hat. When the moles start to run out of food, their inclination is to dig deeper, but Morris decides to tunnel up. He discovers a whole new world aboveground, and gets so distracted by all the wonderful things there that he doesn’t see the fox sneaking up on him. Just as he’s about to become lunch, a hungry wolf comes along and the fox needs a hiding place. The little mole quickly digs a hole, the wolf goes away, and Morris is a hero. The fox and his other animal friends gather a feast for Morris to take back to his brothers. 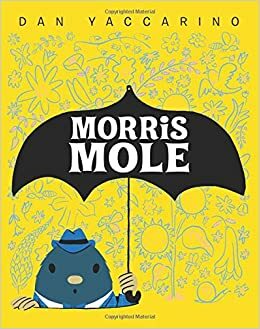 Back underground, the other moles are extremely grateful to Morris, who informs them, “I may be small, but I can do big things.” 40 pages; ages 4-8. Pros: Striking digital illustrations illuminate this tale that celebrates thinking outside the box. Cons: I’m pretty sure moles’ eyes aren’t nearly that big.